The Scoop: Dating websites often attract sign-ups by catering to niche markets or creating unique themes. The online dating market is crowded with competition, so anything dating brands can come up with to make themselves stand out can help them build a thriving online community. Yeezy.dating recently turned heads by launching a dating platform designed for fans of Kanye West. T-Swift fans need not apply. Since it went live in April 2018, Yeezy.dating has wowed singles with its customized features and fun branding. 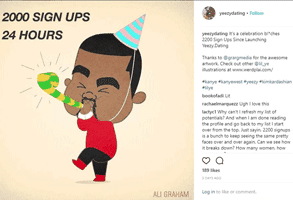 Yeezy.dating saw over 2,200 registrations within its first 24 hours, and it expects to continue growing as people come together over a shared appreciation for Kanye’s record-breaking albums, tell-it-like-it-is personality, and life philosophy. Kanye West is more than just an American rapper who married a Kardashian. He’s a cultural icon, an opinionated entrepreneur, a controversial celebrity — and, say what you will about Kanye, but he knows how to make headlines. Whether he’s catapulting onstage to steal the spotlight from Taylor Swift or complimenting Donald Trump on Twitter, the 40-year-old record producer certainly makes an impression. Everyone has different opinions about Kanye. Taylor Swift: Not a fan. Elon Musk: Surprisingly complimentary. But wherever you fall on the spectrum, you have to respect Kanye’s ability to bring certain types of people together. 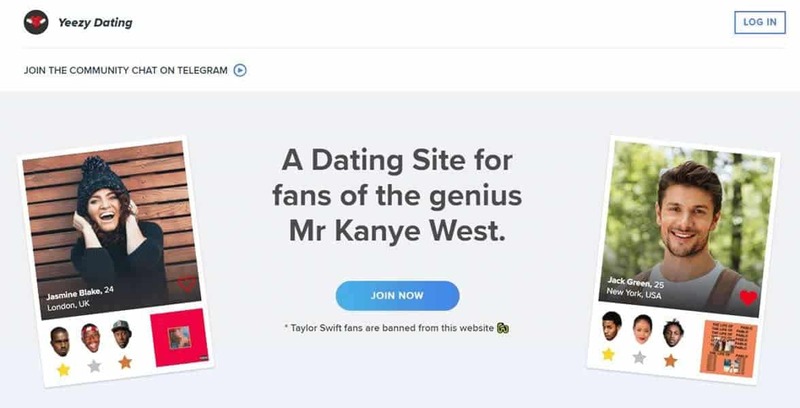 Recently, a passionate Kanye West fan capitalized on the rapper’s unifying appeal by creating a dating site for Kanye West fans. After months of anticipation, Yeezy.dating is now live. And it’s everything you’d expect it to be. Yeezy.dating is a fun dating platform designed to help Kanye West fans shoot the breeze online and meet up in real life. The independently owned dating site offers users custom tools and a clean interface. This isn’t a generic white-label dating site. It’s a well-thought-out, enthusiastic, and original online love letter to all Yeezy’s fans. From its music-focused dating profiles to its Kanye moment of the day, Yeezy.dating aims to impress with a refreshing, outside-the-box approach to online dating. Kanye West is a polarizing figure. Some people can’t stand his pretentious attitude, while others can’t get enough of it. Jackson Mohsenin even goes so far as to list “He’s a douchebag” on Quora as one of the reasons people like Kanye so much. “Say what you will, we like our stars arrogant, especially rappers,” Jackson said. Yeezy.dating has exploded in popularity in a short period of time. People who like Kanye often band together to praise or defend him. They understand something that not everyone understands, and that gives them a solid foundation for a friendly conversation and even a relationship. It makes sense that they get along and would enjoy a space where they can unabashedly declare their admiration for Yeezy. Yeezy.dating has provided a safe haven for Kanye fans. They can gather here to talk about their favorite albums or discuss his latest outrageous quote. And people are clamoring to sign up for this dating site. Right at the outset, Yeezy.dating sets itself apart from other dating sites by skipping the typical registration format. It doesn’t ask users to disclose their ethnicity, height, or religion. It asks them to post a link to their Twitter or Instagram handle and choose three of their favorite musical artists. And, yes, you can choose Kanye three times. 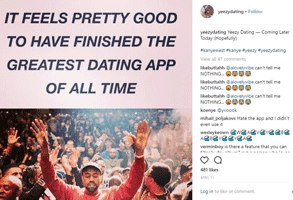 Yeezy.dating engages in an open dialogue with fans on social media. Taylor Swift is not an option for favorite musical artists. In fact, according to the dating site’s homepage, “Taylor Swift fans are banned from this website.” Not really. But kinda. Yeezy.dating boasts a Taylor-Swift-free community, and so any Swifties on the site will be in enemy territory. The bad blood continues. The matching system on Yeezy.dating is familiar. Users can view profiles in the browse section or the matches section. The profiles are automatically sorted by location and age. There are no search tools, so users have to do a little legwork to use up their three daily likes. The reaction to Yeezy.dating has been overwhelmingly positive so far. “I’ve always wanted something like this,” said toweljuice on Instagram. Before the dating site was even live, Kanye fans took to social media to post about their excitement and anticipation for it. Though they hadn’t seen the dating site, they were pretty sure they were going to love it. “This is going to blow up like tidal,” predicted andersolution. Some people even jokingly hailed it as the greatest dating site of all time. “The only relationship I’ll accept in my life is one brought forth to me me by this Yeezy dating site coming out,” said Seth W. Tibbetts on Twitter. Kanye doesn’t even have to be involved in a project to make it blow up on social media and temporarily break the internet. Yeezy.dating has made headlines across the web and seen thousands of sign-ups (more men than women) within its first few days online. This dating site thrives on the controversy and passion stirred up by Kanye’s larger-than-life personality. While Yeezy.dating isn’t perfect, the dedicated team has set itself the task of becoming the greatest dating site of all time by listening to what fans want and offering something different in the online dating scene. Is it for everyone? No. But the people who love it really seem to love it.